Bert was quite impressed by the Bolt when we previewed the Tata hatch a few months back. However, we didn't get the full taste of the dish then. But then we did get to drive the production ready version in Udaipur recently and here's what we think of Tata's latest. 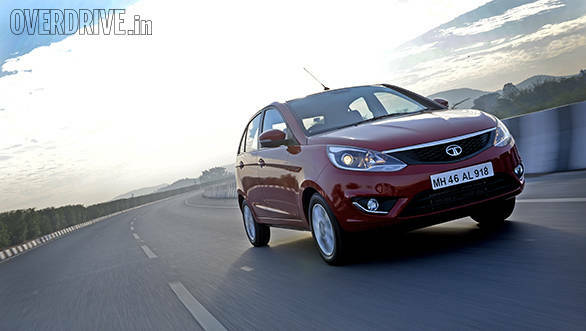 While the overall silhouette and stance of the Bolt look familiar, Tata designers have done a good job by working extensively on the existing X11 platform. Every panel is new - this along with the prominent shoulder and character lines give the car an all-new look. The front end is similar to the Zest so it gets the same signature grille with a piano black surround. The projector headlamps, though, are smoked to go with the sporty theme, however there is quite a bit of chrome used, including inside the headlamps and inserts under the fog lamps. The DRLs seen in the Zest don't make it to the Bolt. They're not even offered as an option. Move to the sides and you will notice that the car is quite tall, more so because of the increased ground clearance, making it ideal for Indian roads. A lower ride height would have improved the stance further. The C-pillar is blacked out to give a floating roof effect and flows well with the rear windscreen, but unlike the i20 that uses hard plastic, the Bolt uses a regular vinyl layer that feels more like a last minute job, but then, it neatly covers the pillar. The rear end, however, is very different yet stylish. Gone are the Christmas tree vertical lamps that were signature to the Indica. Instead a smaller conventional unit has been used. But look closer and you will notice a gloss black insert that has been added to fill the gap between the pillar and the glass. The number plate and a chrome garnish are placed on the tailgate. Step inside, and just like the exterior, the interior is all-new and nothing has been carried from the existing parts bin. 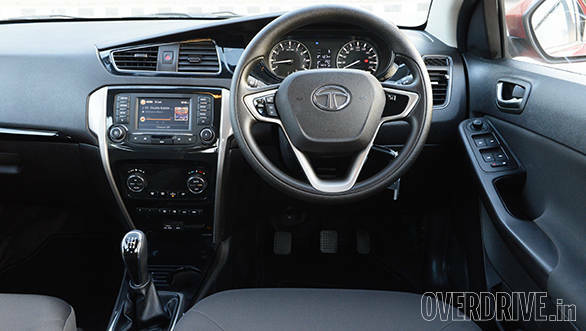 Unlike the Zest that features a dual-tone interior, the Bolt gets an all-black interior to keep the enthusiasts happy. In fact, Tata designers have made an effort to even reduce the use of chrome to make the cabin look a lot more upmarket. The orange inserts that were seen in the car we previewed earlier on OVERDRIVE may be offered only as an option. Like the centre console, few parts of the steering wheel are finished in silver while piano black elements give the cabin a premium feel. Did I mention that the steering wheel, unlike in other Tata cars, is actually nice to grip and sized well? The air vents are shaped well too and gel with the fresh new theme. Fit and finish and overall quality have improved considerably but there are a few areas that still need attention. Overall, the Bolt should appeal to many since it's a smart car both inside and out. The wheelbase is identical to the Vista, so cabin space is impressive. Even tall passengers will find it comfortable to be seated in the rear, thanks to a firm seat and good headroom. Shoulder room is on the higher side too and there is enough space for three grown ups at the back, but the floor board isn't fully flat as the tunnel intrudes quite a bit. 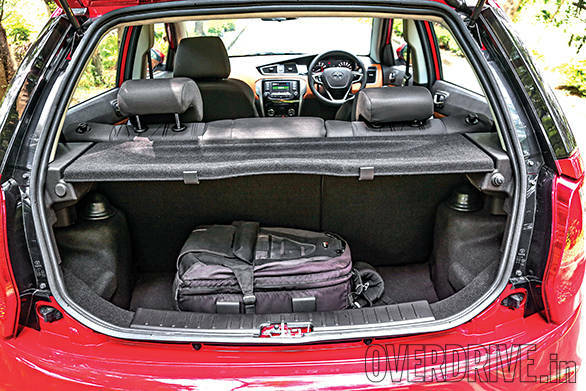 Like the Zest, the Bolt also doesn't offer a lot of storage points. The door pads for instance are large but don't even offer bottle holders. The cup holder in the centre console can only accommodate one cup! Boot space isn't impressive too with only 210 litres being offered. 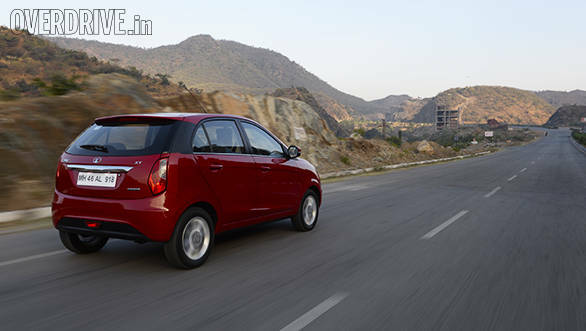 While the Bolt comes in both the petrol and diesel form, this time, however, Tata Motors has shifted focus towards the petrol variant that features an all-new turbocharged unit which debuted in the Zest. 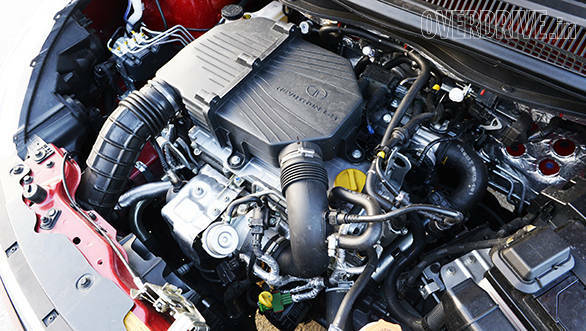 We got to sample this engine around Udaipur since there weren't any diesels among the media cars. The 1.2-litre Revotron motor produces an identical 90PS of max power, however max torque of 140Nm is offered from a lower 1,500rpm up to 4,000rpm (Zest produces an identical torque starting from 1,750-3,500rpm). On the road, driveability is impressive while turbo lag is minimal and the overall feel is very similar to its compact sedan sibling. 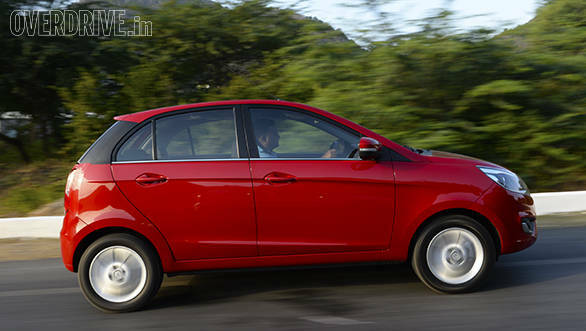 Performance isn't best in segment despite being turbocharged. Surprisingly it takes quite some time to get to 60kmph as compared to other petrol cars in the segment. We didn't test the car but it definitely isn't as quick. A better state of tune should take care of this issue. The Multi Drive function allows one to choose between three driving modes but there isn't a vast difference in terms of overall feel between the Eco and the Sport mode. The 5-speed transmission meanwhile offers positive and smooth shifts. It is the best unit we've experienced in a Tata car so far. The ARAI claimed fuel efficiency figure hasn't been announced yet but expect the car to return slightly more than the Zest (17.6kmpl). The diesel Bolt features the same Fiat sourced 1.3-litre diesel as in the Zest but produces a lower 75PS of max power and 190Nm of torque (15PS and 10Nm less than the Zest). Tata has also confirmed that the car will currently not be offered with an optional AMT. The updated chassis and better tuned suspension ensures that the Bolt offers a good balance between ride and handling. Increased ground clearance and a suspension that soaks in potholes and rough sections well, makes it an ideal car for India. 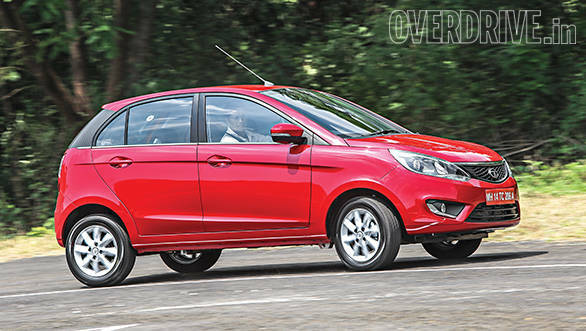 Tata cars have lately shined when it comes to overall ride and the Bolt now takes it a step higher. The European, Korean and Japanese rivals can actually learn a lot from this new hatchback when it comes to ride quality. Handling, though not the best in segment, is quite impressive, the car holds its line well around corners but there is noticeable body roll, the raised height and the softer suspension setup mostly being the culprit. The tyres could have been wider too, the Zest in fact gets better rubber. Brake feel is positive but the car does nose dive more than expected under heavy braking. A lot of comfort features have been offered as standard in the top end XT variant, of which some are even segment firsts. The touchscreen infotainment system developed in partnership with Harman offers a long list of options like Bluetooth connectivity with voice integration, SMS read outs, touch operated AC controls and a picture viewer, to name a few. The stereo even offers eight speakers in total, with good audio output and clarity. These features are similar to the Zest but the Bolt also gets two added features - video playback and navigation. Video files stored on the SD card can be played at any time while the navigation function uses the Android phone's built-in GPS and a MapMyIndia app with four years of free service as well as offline maps. Both the features are unique to the segment. The Zest will also get these extras very soon. In terms of safety, the XT trim offers standard dual-airbags and a new generation ABS system. We maintain that the Bolt does have the potential to do well. Seeing that the Zest has made it to the top selling cars of the month, its hatch sibling should also make it to the chart. The car offers a modern engine, rides well, is spacious and smart looking. A lot of drawbacks from the car's predecessors have been addressed too. The car isn't the best choice especially for an enthusiast but the intent is clear and should appeal to aspiring mid-size hatchback owners more than enthusiasts. The numbers in fact come from this very section of the market. The Bolt is expected to go on sale by January 2015.